Dr. Erik Klemetti is an Assistant Professor of Geosciences at Denison University. He received his Bachelor’s degree in History and Geosciences from Williams College and his PhD in Geology from Oregon State University. He worked as a Laboratory Research Supervisor at the University of Washington and then as a Consultant and Postdoctoral Scholar at the University of California, Davis before joining the faculty at Denison. In addition to his research and teaching, Erik writes for Wired Science in his blog called “Eruptions” that focuses on volcanoes and volcanism. Erik is here with us today to tell us all about his journey through life and science. Erik likes to spend his time watching baseball and enjoying the company of his family. He is also a former music critic, so it’s fun to take some time out of his busy day to sample his fairly large music collection. Scientifically speaking, Erik is a geoscientist who studies volcanoes. In particular, he is interested in what is going on underneath the volcano when it is not erupting. Erik studies the characteristics of the crystals in lava and ash from volcanic eruptions to understand what was going on underneath the volcano before it erupted and what may have triggered the eruption. As a kid, Erik was fascinated with rocks and grew up surrounded by the awe-inspiring volcanoes of Columbia. His surroundings likely had a big impact on him, but his curiosity was also nurtured by his family. One of his grandmothers was an amateur rock collector, and he was enthralled by her rock and mineral collection. He struggled to choose a field of study in college though and cycled through various majors and tried different jobs before deciding that geology is what he really wanted to do for a career. One challenge in Erik’s work is that it is a long and tedious process to get the intended materials out of the rocks and crystals he is studying. When Erik was a postdoc at UC Davis, he was trying to extract radium from crystals in volcanic rock from New Zealand to determine the age of the crystals. There is only a tiny amount of radium in the crystals and the extraction process takes months. There were whole batches (months of work) where he wasn’t able to extract anything useful and had to go back to square one each time and try again. Looking back, Erik is pleased to have received a tenure track faculty position and been granted tenure in this tough academic job market. He is also pleased about one of his lab’s recent papers on the Lassen Peak volcano in California. It was published this year in PlosOne, and this was particularly meaningful since it is the 100th anniversary of the last eruption of Lassen Peak. Most of Erik’s PhD research was conducted in the desolate desert Northern Chile on a volcano where the summit was at 20,000 feet high. There were, however, some unexpected interruptions in the sense of isolation. For example, one day his group was sitting at the campfire, and they saw a local person pass by carrying a live lamb in his backpack to sell at the market in the next town over. It seemed remarkable to them to travel so far through this uninhabited stretch, but very commonplace for their new acquaintance. Geosciences is a highly collaborative field, and geoscientists generally enjoy working with other people in the lab and the field. His lab has shared some fantastic times together sitting around campfires, hiking through mountains, and just hanging out. They have gotten through some tough situations together including being stuck in the Sierra Nevada Mountains as a big thunderstorm rolled in. You should stay diverse in your interests. You do not need to be constantly in the lab only doing science to be a successful scientist. Erik is a Massachusetts native who spilt his time as a youth between New England and Colombia. He attended Williams College, a small liberal arts college in the Berkshires, where he majored in both Geosciences and History (and radio, if one could count the endless hours in the music office of WCFM). The call of the mountains meant that he decided to move west for graduate school, taking up residence at Oregon State University where he did his PhD working on a volcano in northern Chile called Aucanquilcha. He went on to run a lab at University of Washington before starting a stint as a postdoctoral researcher at UC Davis, where he worked on the Okataina Caldera Complex on the North Island of New Zealand. It is at UC Davis where Erik learned to love zircon, the crystals erupted in lavas that record age and compositional information about what the magma was doing under the volcano before it erupted. 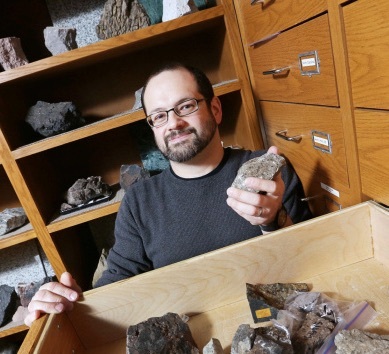 In 2009, he started as an assistant professor of Geosciences at Denison University, teaching the “hard rock” classes including Rocks & Minerals and Petrology & Volcanology. Since arriving in Granville, he’s been working on projects at Lassen Peak and Mineral King in California. This spring, he was granted tenure at Denison He also writes a blog about volcanoes called “Eruptions” for Wired Science. In his spare time, he’s busy with two kids and an undying (and these days less painful) love for the Red Sox.